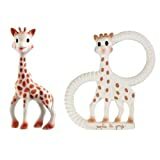 I love the Vulli Sophie Giraffe, but would not ever use this vendor again. I purchased these items as a gift, but when the items arrived the packaging was damaged. Extremely poorly packaged. I ended up having to repurchase the item at a store because I didn’t have time to reorder it. So much for the convenience of online shopping.